In March of this year, a small tech firm called Development Seed was contracted by the United States government to help launch the healthcare.gov website, just in time for the biggest healthcare revision in U.S. history. Obama officials had been reading the agency’s blog, and liked what they read. So Development Seed was approached to develop the “frontend” section of the new website. Development Seed had become popular on Github.com, the widely renowned open-source repository site, and in June the small startup company based in a garage (yes, a garage) in Washington D.C. released their code in transparent fashion on Github, to the surprising satisfaction of many critics. The critics praised Development Seed for its design and slick, well-developed layout especially. Pretty good for a government website was generally the sentiment among critics and admirers alike. With this auspicious beginning, the official U.S healthcare website was surely on its way to having a smooth launch in the fall. However, this was before CGI Federal, the primary subcontractor with the U.S government, took over its part in the website’s inception. CGI Federal is a subsidiary of CGI Group, the largest tech firm in Canada, which has risen largely through acquisitions, as well as by providing a large number of its IT services to major companies like Bell Canada. It was in July that CGI Group bought rival British company Logica, doubling its employee base to 72,000 in 400 offices worldwide, 11,000 of them in the United States. CGI got its start with the U.S. government IT contracting scene in 2004 when they purchased the contracting company American Management Systems; but it wasn’t until 2010 that they became a rising star in America by ramping up business with a $1.1 billion acquisition of the U.S. based military IT group Stanley Inc. After that, contracting work for government websites started to shoot through the roof. With the U.S. government supporting them, CGI became known as a reliable company, even though back in Quebec they’d dropped the ball on a $46.2 million contract healthcare medical registry that officials ditched after missed deadlines. In what has become a characteristic quality of recent American administrations, the federal government ignored these red flags, and decided the company was competent enough for this critically important project. In 2009, CGI Group helped build the U.S. Environmental Protections Agency’s FederalReporting.gov hub, a high-volume site built in just six weeks for much less the cost than they’d get for the healthcare.gov. But the real prerequisite that CGI Federal passed was their work upgrading Medicare and Medicaid’s systems, a job they had since 2007. This was their shoe-in as the main contractor for healthcare.gov, and why they were handed the $678 million to handle various services under a new contract with the U.S. government, but only $93.7 million for the actual website. Of the 55 separate contractors hired on to help with the rollout of the healthcare marketplace, CGI Federal was the primary contractor. Their duties were to make the “backend” part of the site. The API marketplace that would connect the 36 states that elected to participate in the federal marketplace, and make the data hub work smoothly, was the Development Seed modern interface. Since Development Seed had written the code for the API marketplace, it hadn’t been in contact with CGI. This was obviously a major issue, in addition to the fact that while Development Seed wrote Open Source, CGI Federal did not. And so the IT procurement for one of the biggest government websites ever created was one of dysfunction. It was a clear case of two business languages that could not understand each other. This left healthcare.gov with the problem of being a nice book cover, without anything in the book. Many have come to the defense of CGI Federal by claiming they were bogged down with time restraints and being under-financed. Increasingly, it looks as if government bureaucracy was to blame for contracting them in the first place. Regardless, the biggest critique in the tech world over the debacle will ultimately be the lack of consistency in the code. How can someone expect consistent communication if the two languages can’t even speak to each other? If the waiters in the dining room don’t know what’s going on in the kitchen, how can a restaurant operate? In fact, the waiters can’t even order from the kitchen. The fact that this oversight went unnoticed, despite the glaring recent history of problems and the vast amount of taxpayer money at stake, is just one more red flag toward the roll-out of the biggest government expansion into private lives in recent history. As either a funny or depressing anecdote to this sad story of mismanagement, the very company that was responsible for the site’s layout and design experienced issues in trying to procure healthcare itself. “This week I had wanted to come in and get everyone registered,” said Eric Gundersen, President of Development Seed. 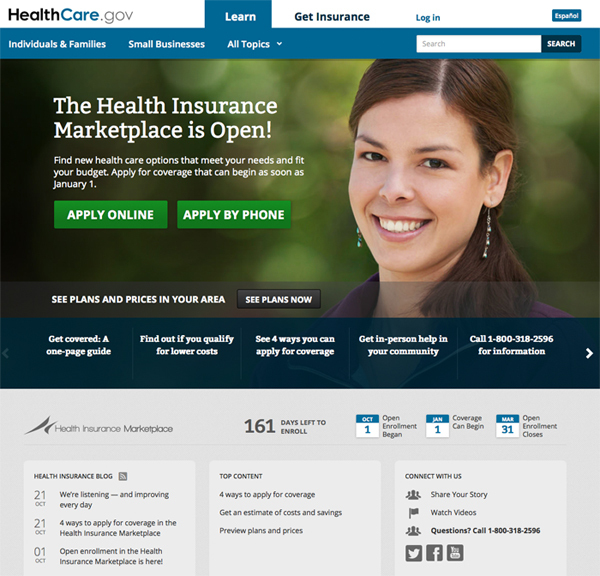 “I expected I would be able to register and get health insurance. This is not the launch I expected.” Meanwhile, CGI Federal has declined any requests for comments to the press. Back in June, when it was announced that the website’s code would be open source and held on Github, The Atlantic wrote at the time “This is a win for the American People.” Unfortunately for the American People, no one won this time around. And after a long look at the situation, it seems like another case of a dysfunctional and overreaching government sacrificing the needs of its people for more control and power over a vital industry.